Lev has become the personal perfumer to Renata Przemyk – The Polish Indie Music Icon. Lev is creating a bespoke perfume for this phenomenal Artist. During the session, Renata picked amazing extracts for her perfume. Her choice reflects her sophisticated, elegant and unique style. 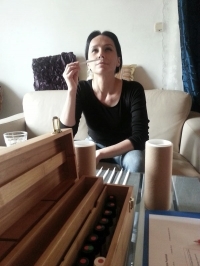 Renata Przemyk during her perfume session with Lev Kallos.